I still need some opinions from you guys if my two lenses are definitely okay for the task of condensing light to a small image pickup device like a photo diode or dome sensor? Also is it necessary to have that square glass piece between the two condenser lenses? Anyhow I hope to get cracking on this project soon. aussie_bloke wrote: Also is it necessary to have that square glass piece between the two condenser lenses? More work ! As your condenser lenses were taken from a projector the sq. glass is propably a heat filter in order to protect the slides from heat from the projector lamp. That could be quite a high wattage depending on age and type of projector. “One small step for a man,"......because he has Arthritis. It is correct that the two condenserlenses are different. The dome shaped surfaces should be pointing to each other. The rays of light there, in between the two lenses should be parallel. If you want to know about the lenses try to focus the light of the sun to a small spot. The sphered side towards the sun. Then measure the distance from the flat side to the smallest sunspot. This is the focal distance. It is different for both lenses of course. For a projector the filament of the lamp should be in het focus point of the lens with the shortest focal distance. For a Nipkow disc camera there should be the photo detector. The direction of the light is reversed, isn't it? The projection lens or for you the taking lens should be in the focuspoint of the other lens. For a projector this is because you wat as much light of the lamp going through the projection lens. Then the slide should be in the focus point of the projection lens. Otherwise the projected picture isn't sharp. 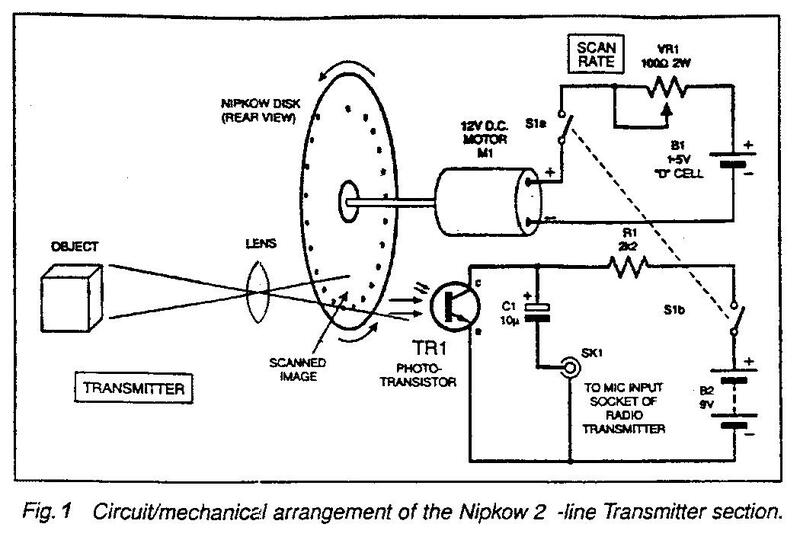 For a Nipkow disc camera everything is reversed. The Nipkow disc shoul be in the focus of the taking lens. The taking lens should be in the focus point of the more flat condenserlens as well. This is to collect as much of the light through the Nipkow disc and make parallel light of it. Then the second condenser lens concentrates this onto the photo sensor. Read the chapter about sperical aberation in the NBTV Handbook to understand why you need to do it in this way. In principle you don't need the heat filter, however if you use a silicon diode as a sensor this filter might keep the IR out of the sensor. That gives a much better grey representation of the different colours. But is degrades the sensitivity of the camera as well. Klaas Robers wrote: In principle you don't need the heat filter, however if you use a silicon diode as a sensor this filter might keep the IR out of the sensor. That gives a much better grey representation of the different colours. But is degrades the sensitivity of the camera as well. ooooh that's a good idea Klaas, why didn't I think of that? Troy you should at least allow room for placing the heat filter in as an experiment. Thanks for the input everyone. I have done some optical testing to see if I can get the lens system to shrink the picture to a size small enough to be picked up by say a photo diode. Have placed a C mount lens and a test subject (a doll ornament) at the appropriate distance away, then placed the less domed lens in focal position behind the C mount lens, then I did a little trial and error test positioning of the more domed lens and settled for about 1.5cm behind the less domed lens, then I positioned a piece of paper at the end to determine the focal point of the condensed image. The results to my opinion look quite good, the doll appears to be only 4-5mm in height so the lens system appears to work! :D Of course that French NBTV camera used two dissimilar domed lenses as well and they were strategically positioned to correctly shrink and focus the image being picked up. I found that using the club's dome sensor it was advantageous to slightly defocus the image on the sensor or else you get a perfect image of the sensor surface, blemishes and all. You should define the focal length of the less curved lens of the condensor system and place that lens at THAT distance from the taking lens. As the taking lens can be seen as a point source because of its small diametre, the light leaving the less curved condensor lens should be PARALLEL. Then the more curved lens placed almost against the less curved one (in theory the distance is of no importance as the light beam is parallel) will focus the parallel light to a small light point, and NOT an image of your object. This is the size the photo sensor should have at least. So the condensor lens is making an image of the taking lens on the photo cell. Please look into the chapter about optics in the NBTV Handbook. It is written by Grant Dixon to teach you how optics work and how to use it. Thanks for the info Klaas. I have read the optics chapter on site a few months back after the failure of my first stab at a NBTV camera though will have to go through it again so have printed that chapter out for re-read. Anyhow I have pressed on with making the lens system and have nearly finished making the racking system for the lenses. The less curved lens is going to be fixed at the front, the hemispherically curved lens will be rackable (even though its not necessary) and the image pickup sensor will be rackable. For image pickup I have decided to go for the photo-transistor circuit http://1.bp.blogspot.com/-IvI6yE5Zxzw/T ... 0/Fig1.jpg involving just simply a photo transistor, 2k2 resistor and a 10uf capacitor. I put those components on a breadboard and tested the circuit with the output connected to my scope, I flashed a torch across the phototransistor and I got a waveform response so I am quite happy with that! In picking of lenses, I looked at a typical C mount lens used with 2/3" vidicon tube cameras and found that the maximum image size it will project is about 1cm, I then tried a C mount lens used with a 1" vidicon camera and got about 2cm projected image and then I ripped the lens out of the slide projector I got the condenser lenses from and it can project the image at a size of over 5cm in diameter. Correct me if I'm wrong but obviously projecting a bigger image with a bigger Nipkow disc with wider holes is the way to go for good light sensitivity isn't it? I can see with the French NBTV camera which I'm using for reference, a projector lens is used so . Now I've hit a stumbling block in regards of using templates to mark and drill the holes. Basically I want to make this camera both camera and monitor using the one disc (1.5 turn spiral 48 holes), and the disc is going to be a LP record which is 30cm in length. The problem is with using Gary's template program, I can't save the templates as an image and easily cut the image into 2 or 4 segments to print to multiple A4 papers. I can do a screen dump, past the template in Corel Photopaint but when the template isn't zoomed 1:1 the template looks rough at the circle and the crosses look to have one end longer than the other (see pic at bottom), I had this issue when doing the multi-standard televisor and I think it might of contributed to the inaccuracy of the holes. so I was wondering if anyone has a 1.5 turn Nipkow template in image format (jpg, bmp etc.) that can be resizable in a photo program and divided and printed to multiple papers? The main reason I don't export as an image file is the loss of accuracy caused by doing so. It is much better to print out from the native (vector) format. Unfortunately my programme only allows you to print out to the size of the sheet the printer uses. This is laziness on my part but the main reason is it is extremely difficult to print out multiple pages of a graphic in MFC - it can be done but it could take me about a week to work it out. Instead the idea is you can import the industry standard DXF file into one of a zillion free programmes that will allow you to open or import a dxf file and print it out. Thanks for the info, have downloaded SketchUp, unfortunately it won't let me import dxf files, looked up the help centre on that and it says I have to get SketchUp Pro which you get an 8 hour free trial before you have to pay to register. Anyhow have gotten a java program to view/edit dxf files and also export them as image files too. Couldn't find a way to print it to multiple pages so just decided to export the template as a bitmap, cut it in two in Corel Photopaint and resize the 2 pieces to the size I wanted and print them out, I somewhat believe it should be okay or at least better than the screen dump/print method anyhow. Oh sorry about that I didn't realise it was only in the pro version. There are many dxf viewers out there, but perhaps the best way is for me to import it into my sketchup and send you that because sketchup should allow you to print it out at the highest possible resolution and accuracy - the only downside is that it doesn't optimise the number of sheets to print out on - however a couple of extra sheets of paper is a small price to pay. If you would like to try that send me your dxf file and I'll send back the sketchup dwg. Actually I was working on a sketchup plugin to draw nipkow disks so perhaps I should finish that off sometime. The other possibility is to see if your local print shop to print a full size version for you - not sure how much that would cost but you wouldn't think it would be that much. It would be very accurate. Of course, you could always build yourself a CNC machine like I did and then you don't have to print it out at all I built mine for about $200. Oh Troy I can also export them as images, pdf, etc so you would have your template - but I still recommended printing from a vector viewer for resolution and accuracy. gary wrote: Oh sorry about that I didn't realise it was only in the pro version. Thanks Gary. I was using your 1.5 turn 48 hole spiral dxf file though the size was not to what I need for my LP record disc but I am unable to make 1.5 turn discs in your NipkowDXF program, how did you make the 1.5 turn disc? I have attached the DXF anyhow. I think you will have to make your mask smaller ......one line at a time not sure of the effect of your sensor seeing two if it would still work or not at all..
Ok Troy here is the version that can create a 1.5 spiral (attached). I have determined to my satisfaction that the best way to print these out is as a pdf. I attach two pdfs one with a .125 inch and one with 1 inch (2.5 cm) - I am using imperial units because vinyl records are 12 inch - it's just easier for me being an old guy. It's reasonable to make the first aperture as close to the edge as possible as it makes the image as large as possible - to do that you must use a mask which is a thin piece of material like card board, plastic, or metal that has a rectangular or, preferably, a keyhole shape hole cut in it that *just* covers the apertures 1 - 32 for the camera and 17 - 48 for the monitor. The mask looks pretty much the same as what you have labelled as lens mount in your diagram. When and if you print out the pdfs make sure you select poster mode - it really seems to work very well - I'm impressed.